: Pastoral guardian in the mountains. : Mrs Pamela Jeans-Brown, revised by Raymond Triquet and Alain Pécoult). : Present in the Pyrenees from time immemorial, known in the Middle Ages and used as a guardian of castles, it is mentioned by Gaston Phoebus in the 14th century. Already appreciated as a companion dog in the 17th century, it reached glorious heights at the court of Louis XIV. The first detailed description of this breed dates from 1897 in the book by Count de Bylandt. 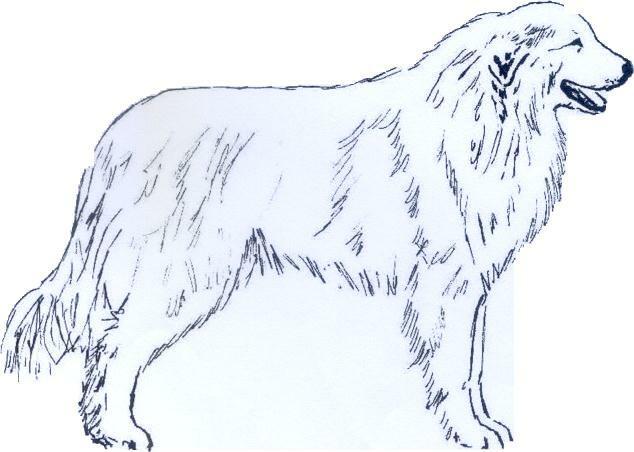 Ten years later the first breed clubs were set up and in 1923 the Réunion of Pyrenean Dog Fanciers ( Réunion des Amateurs de Chiens Pyrénées – R.A.C.P. ), at the instigation of Mr Bernard Sénac-Lagrange, registered the official standard with the SCC (Société Centrale Canine, French K.C.) the current standard is still very close to the standard worked out in 1923, only a few clarifying amendments having been made. : Dog of great size, imposing and strongly built, but not without a certain elegance. The widest part of the skull is equal to its length. The length of the body from the point of the shoulder to the point of the buttock is slightly greater than the height of the dog at the withers. The depth of the chest is equal to, or slightly less than, half the height at the withers. : Used on its own to guarantee the protection of flocks from attacks by predators, its selection depended on its aptitude for guarding and dissuading as much as on its attachment to the flock. The resulting main qualities are strength and agility, allied to gentleness and attachment to those it is protecting. This protecting dog has a propensity for independence and a sense of initiative which demand a certain degree of authority from its owner. : Not too large in comparison with the size of the dog. Its sides are fairly flat. : The widest part of the skull is equal to its length. It is slightly rounded due to the sagittal crest being perceptible to the touch. Because the occipital protuberance is apparent, the back of the skull has on ogival shape. Superciliary ridges are not pronounced. The median furrow is scarcely perceptible to the touch between the eyes. : Broad, slightly shorter than the skull, narrowing progressively towards the tip. Seen from above it forms a blunt “V”. Well filled below the eyes. : Not very droopy, just enough to cover the lower jaw. Black or heavily marked with black, as is the palate. : Complete dentition with healthy, white teeth. Scissors bite (upper incisors overlapping lower incisors without losing contact). Pincer bite tolerated as are the two lower pincers tipping forward. : Rather small, almond-shaped, set slightly obliquely, with intelligent and contemplative expression, of amber-brown colour. Eyelids never loose. Gentle, dreamy look. : Set on level with the eye, fairly small, triangular in shape and rounded at the tip. They fall flat against the head and are carried slightly raised when the dog is alert. : The length of the body from the point of the shoulder to the point of the buttock is slightly greater than the height of the dog at the withers. The distance between the sternum and the ground is approximately half the height at the withers, never less. : Of good length and strong. : Slightly oblique with fairly prominent haunches. : Not too low, but broad and long. Let down as far as the elbow but not lower. Its height is equal to or slightly less than half the height of the dog at the withers. The ribs are slightly rounded. : It reaches at least as far as the point of the hock. It is bushy and forms a plume. Carried low in repose with its tip forming a hook for preference. When the dog is alert, the tail rises towards the back, forming a strong circle with only the tip touching the loins (making the wheel “arroundera” to quote the expression used by the people of the Pyrenees). : Well muscled and moderately long. : Straight, strong and well-fringed. : The wrist is in line with the forearm. : Not long, compact, with slightly arched toes. : The hind legs have long, more abundant fringes than the forelegs. Seen from behind, they are perpendicular to the ground. : Well muscled, not very long and moderately oblique, well-defined muscle. : Moderately angulated and parallel to the body. : Of moderate length, strong. : Broad, lean, moderately angulated. : The hind legs cach have double well-formed dewclaws. The front legs sometimes have single or double dewclaws. : The movement of the Pyrenean Mountain Dog is powerful and free, it is never ponderous, the movement is extended rather than fast, and not without a certain suppleness and elegance. The angulation of the dogs permits an unflagging gait. : Thick and supple, often showing patches of pigmentation over the whole body. : Well-furnished, flat, quite long and supple, rather crisp on the shoulders and back, longer on the tail and around the neck where it can be slightly wavy. The trouser hair, finer and woollier, is very thick. The undercoat is also thick. : White or white with patches appearing grey (badger or wolf) or pale yellow or orange (arrouye) on the head, ears, base of the tail and sometimes on the body. The most appreciated are badger grey patches. Males from 70 cm to 80 cm. Females from 65 cm to 75 cm. A tolerance of + 2 cm is allowed for perfectly typed specimens. General appearance giving the impression of heaviness, without distinction. Flat, flabby, sluggish dog. Head: Too heavy, rectangular in shape. Skull too broad, bulging forehead. Stop too pronounced or non-existent. Lips too pendulous forming flews. Insufficient pigmentation on the nose; eye-rims and lips. Eyes: Round, light, deep-set or prominent, too large or too small, set too close together or too far apart. Third eyelid visible. Hard expression. Ears: Broad, long, curled, folded, carried too far back, set high. Neck: Slender, a little long or on the contrary, too short, giving the impression that the head is sunk into the shoulders. Too much dewlap. Body: Sway or roach-backed dipping, whippety or drooping belly. Chest: Too broad or too narrow, slab-sided or, on the contrary, barrel-chested. Tail: Not enough furnishing or carried badly, too short or too long, without a plume, not “making the wheel” in action, or making it continuously, even in repose. Forequarters: Turning out or turning in. Too open a scapulo-humeral angle. Hindquarters: Turning out or in. Hock too straight or too angulated. Coat: Short or curly, silky, soft or lack of undercoat. Behaviour / Temperament: Aggressive or overly shy. Jaws: Over or undershot, or any malformation of the jaws. Eyes: Flesh colour on the eye-rims. Yellow eyes. Dewclaws: No dewclaws or single dewclaw or atrophied double dewclaws on hind feet. Colour: Any colour not specified in the standard. Size: Outside the limits. Any dog clearly showing physical or behavioural abnormalities shall be disqualified.